Pigments isn't just a pretty name, it makes excellent use of colour to differentiate modulation sources. Here we can see LFO 2, in yellow, is modulating Wavefolding Amount and Filter 2 Frequency Shift. Arturia built their reputation on software recreations of classic synths, now they're back with one of their own. Arturia have been in the virtual instrument business for 20 years. Their first product was a complete software music studio called Storm, but it wasn't until they began to focus on software recreations of classic hardware synths such as the Sequential Circuits Prophet 5, Roland Jupiter 8, ARP 2600 and Moog Minimoog that the company really took off. Since then they've successfully moved into the hardware market with synths, drum machines, MIDI controllers and audio interfaces. Storm has long since been retired, but now Arturia are returning to their roots with a software synthesizer entirely of their own design. Pigments is a plug-in and stand-alone instrument available on Windows and Mac OS X in all the usual formats. It is what I like to call a 'big synth' (OK, not the most inspired name): a behemoth that bestows many tools on the sound designer. Not something you'll master in one evening, but something that could become a go-to instrument for a wide variety of sounds. 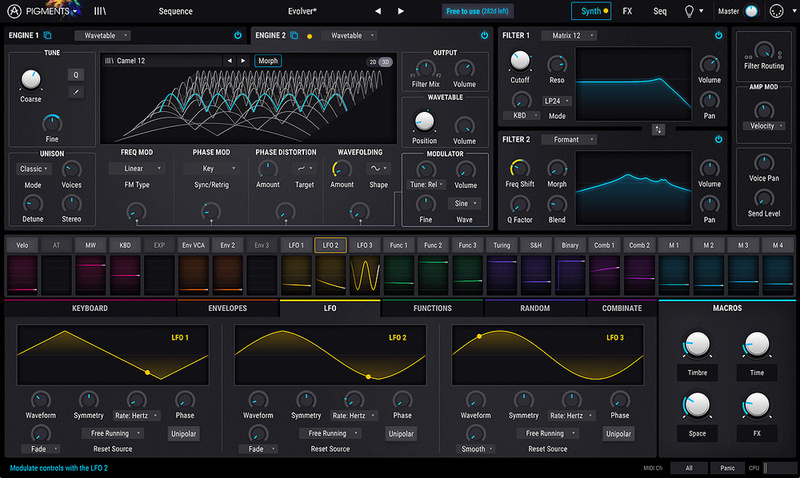 Fundamentally, Pigments is a wavetable synth. It can do virtual analogue too, but it does not focus on faithful recreation of analogue timbres. For that you can look at Arturia's other offerings. After installation and authorisation Pigments will prompt you to set up your audio and MIDI settings and then you're ready to go. 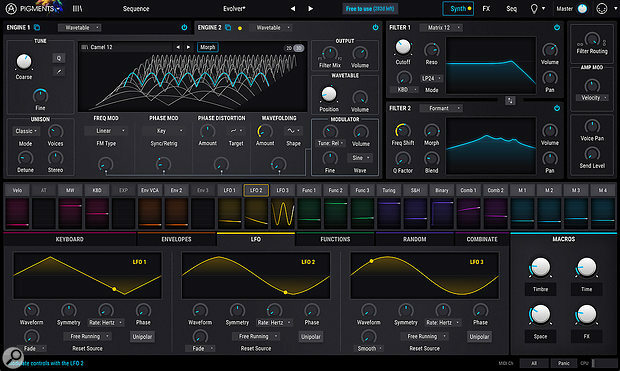 The interface is clean and well designed with nice use of colour to differentiate between modulation sources. The top half of the screen can display Synth, Effects and Sequencer. The bottom half is permanently dedicated to modulation sources, which are deep and plentiful.